Collagen Extra® anti-ageing formula with collagen Peptan® SR marine. It boosts fibroblast proliferation and favours the synthesis of the major structural collagen molecule of the dermis, thus preserving its structural organization. 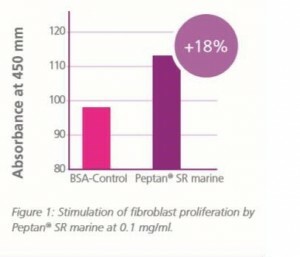 Peptan® SR marine activates collagen synthesis by fibroblasts. It restores the three dimensional architecture of the dermis, increasing the volume of the tissue providing it with cohesion and tonicity. It affects the extracellular matrix of the dermis in order to counteract the loss of firmness which occurs over time, and eventually leads to wrinkles. 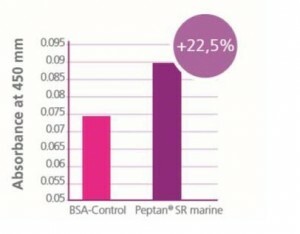 Peptan® SR marine provides protection against agents generating free radicals. PROLIFERATION XTT cell proliferation test Cultured human skin fibroblasts were treated after 24 hours with Peptan® SR marine at a concentration of 0.1 mg/ml. After incubation for 24 h, XTT cell proliferation test was used to assess the viability and proliferation of the fibroblasts. The absorbance at 450 nm is determined by spectrophotometry and the results are expressed as a percentage of the value for untreated controls. The incubation of 0.1 mg/ml Peptan® SR with cultured fibroblasts for 24 hours induced a significant increase in fibroblast proliferation to 18% higher than that of an untreated control (p=0.016). IN VITRO TEST VS BSA CONTROL Human dermal fibroblasts were cultured and, 24 hours later, 0.01 mg/ml Peptan® SR marine was added to the culture medium. Asacontrol, fibroblasts were incubated with 0.01 mg/ml BSA. Two days later, collagen I in fibroblasts was quantified by staining with Syrius Red by a fluorimetric method. The treatment of fibroblasts with 0.01 mg/ml Peptan® SR for 2 days induced a significant increase in collagen synthesis to 22.5% higher than that of the BSA-treated control (p<0.05). Figure 2: Stimulation of collagen synthesis by fibroblasts induced by Peptan® SR marine (0.01 mg/ml), as shown by comparison with Control at 2 days. EFFECT OF PEPTAN® SR marine ON THE ORGANIZATION AND DENSITY OF FIBROBLASTS Figure 3: Fibroblasts incubated for 7 days with 0.01 mg/ml BSA (left) and 0.01 mg/ ml Peptan® SR marine (right), after staining with Sirius Red. oxidation conferred by the reference antioxidant (BHA) per gram of product tested. 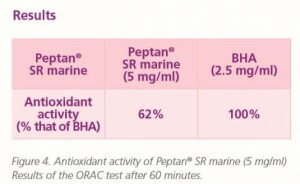 The antioxidant activity of Peptan® SR (5 mg/ml) was about 62% of that of BHA.